Generally speaking for ninjas to escape from enemies or hostile territories was much more important than invading hostile residences because it was not such a big problem for ninjas if they failed the mission. In that case, they could have another chance. By then, they could afford to have time to consider another method and reflect on their last failure. In contrast to that, if ninjas were captured by enemies in their escape all would be over. They would be tortured and made to confess everything they knew like their purpose and mastermind. For that reason, ninjas worked out a lot of ways of escaping. They were called " Tonso-Jutsu (遁走術) ". To scatter makibishi (まきびし) onto their escape route was one of them. Tonso-Jutsu was systematized as " Goton-Sanjippo (五遁三十法) " . " Goton (五遁) " means the five basic materials in nature. 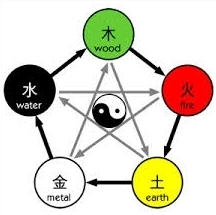 They are wood (木), fire (火), earth (土) , metal (金) , and water (水). This idea is based on Taoism (道教) in China. According to Taoism, everything in our world is composed of these five elements. Ninjas applied this theory to the method of their escape. In short, ninjas utilized these five components in their escape and " Sanjippo " means 30 ways. It indicated that ninjas basically have 30 means of escape based on Goton, furthermore, these 30 escapes can be divided into three categories. They are " Ten (天 heaven) " , " Chi (地 earth) " and " Jin (人 man) ". These three classes had 10 methods for escape respectively. I want you to think that this distinction is not a strict division but a rough grouping. In real escapes, ninjas combined these methods according to the circumstances. Well, I am going to show you these three categories for escaping in detail.
" Tenton-Jippo (天遁十法) " was the technique for escaping by means of taking advantage of natural phenomena like the sun, wind, and rain. As you know, in weather forecasts everyday on TV, weather is hard to predict but ninjas had skills and rules of thumbs to foresee the weather for every moment. The techniques were as follows. To escape by means of the sun. Like standing with your back to the afternoon sun. A ninja escaped from his enemy while he was being blinded by the sun light. To escape by means of the moon. For example, a ninja escaped at the moment when the moon is hiding behind a cloud at night. To take advantage of the light of stars at night. To escape by means of a movement of clouds. A ninja escaped by the change of brightness brought on by clouds in the day and night. To escape by using fog. A ninja took advantage of the poor visibility caused by fog..
To utilize thunder. A ninja escaped from his enemies while they are being surprised at the sound and light of thunder. A ninja generates static electricity and makes enemies astonished by it. The ninja escapes from there in the gap..
A ninja utilized the sudden wind and the cloud dust brought by the wind. The ninja escaped from his opponents while they were being blinded by them in a moment. To utilize rain. For instance, a ninja escaped while a shower was blocking the view of enemies. To take advantage of snow. For instance, a ninja prepared the protection against cold in advance before his mission and escaped in a snowstorm from enemies.
" Chiton-Jippo (地遁十法) " is the the escaping skill utilizing natural materials on earth. Strictly speaking, Goton (wood, fire, earth, metal, water) which was introduced before is included in this category. To use wood for escape. For instance, a ninja lures enemies into the place where logs are set against the wall. As soon as they arrive there, the ninja lets the logs fall onto his chasers..
To work the grass on the ground into something. Like tying the grass on the earth and making them into some loops. When pursuers are running there, the loops will make them stumble and fall down. This is famous as " Katon-no-Jutsu (火遁の術) " but actually this was not something mystical and showy. Only a ninja set fire to something and tried to escape from there in the opportunity of commotion. In this case, it was more favorable if the ninja could join the people running away from the fire. To use soil. Like throwing a mass of soil and sand toward an enemy and making them blind temporarily to escape or a ninja hiding in a cave. To make a use of buildings. For instance, a ninja lurking in a shed. To take advantage of everything metallic. For example, a ninja throws metal weapons like shurikens (手裏剣) or kunais (苦無) at his chaser. Or else, a ninja scatters coins while the pursuer or passerby are picking them up the ninja can escape. To use both big and small stones. For instance, a ninja hides behind a huge rock or drops big stones from up on a hill onto enemies while running on the foot of a slope. Further to this, he throws stones at them directly. This is also well-known as " Suiton-no-Jutsu (水遁の術) ". This technique is something using water for escape. For instance, a ninja stays in a river, pond, or moat of a hostile castle and lets his chasers go past or escapes by diving and walking from there in the water. In another case, a ninja throws a big stone into a pond and deceives his enemies like he dived into the water, with that deception, the ninja can leave there. To use hot water for escape like throwing hot water at his enemy. "Jinton-Jippo (人遁十法) " is the art of escape by means of using live humans and animals. This technique belongs to " Taijin-Jutsu (対人術) " in a broad sense because ninjas controlled others by this method and Jinton-Jippo required ninjas to have an acting ability in order to pass themselves off as other people. For instance, a ninja in an escape impersonates one of his chasers and cries "The ninja has run to the left side! You all go to the left. I am going to go the right to block his escape route". No one could ever imagine that the ninja, whom they are chasing, is screaming this so the ninja can escape from there leisurely. Well, we are going to look at individual methods of these techniques. To take advantage of males to escape. Like creeping in male groups doing manual labor. To use women for escape. For instance, if a disguised ninja is walking with a female it seems like only an ordinary couple. To exploit old men. Like disguising themselves as an old person. Generally speaking, people do not have any caution for old men. To utilize infants. A man with an infant also tends not to be seen with caution much..
To pretend to be superior people. For example, an escaping ninja orders two gatekeepers of a hostile castle oppressively like this " A spy has invaded this castle, this is the command of our lord, close the door immediately and don’t let anyone out from this site! ". Or in the opposite case when a ninja is being pursued in the garden of the castle and the doors are closed, the ninja shouts " This is an urgent order of our lord, I have to go to the doctor immediately, open the door! " . To exploit poor or low-class people by disguising themselves as them. People seldom care about them. To use birds. For example, when a lot of birds are crying simultaneously, the noise is extremely loud. A ninja takes advantage of this phenomenon for his escape. At night when he is being chased in the forest, the ninja kicks on a tree on which many birds are sleeping so the birds will awake because of the shock and scream loudly. Soon other birds will also cry infectiously in the same way and the sound becomes enormous. It is enough to astonish chasers then the ninja can escape. To exploit animals, like letting a horse go which is tied to a post and the ninja causes a commotion..
To use worms and reptiles, like throwing a snake at the enemy. To make use of fish. For instance, a ninja throws them onto the feet of chasers. They are so slippery that the pursuers fall down. Then, the ninja can gain time to escape.